Second Edition provides up-to-the-minute discussions on the application of mass spectrometry to the biological sciences. Shows how and why experiments are performed and furnishes details to facilitate duplication of results. Instrumentation and ionization methods for the analysis of biological materials by mass spectrometry; high resolution mass spectrometry and accurate mass measurements of biopolymers using MALDI-TOF; a novel geometry mass spectrometer, the quadrupole orthogonal acceleration time-of-flight instrument, for low femtomole/attomole range biopolymer sequencing; affinity techniques combined with mass spectrometry; screening molecular diversity using pulsed ultrafiltration mass spectrometry; mass spectrometry in immunology - identification of a minor histocompatibility antigen; strategies for the rapid characterization of recombinant and native proteins by mass spectrometry; mass spectrometry in drug discovery; analysis of glycoproteins; analysis of phosphorylated protein by mass spectrometry; mass spectrometry-based approaches towards the study of regulated biological systems; gels in vacuo? a minimalist approach for combining mass spectrometry and polyacrylamide gel electrophoresis; studying noncovalent interactions by electrospray ionization mass spectrometry; protein-protein and protein-ligand interactions studied by hydrogen/deuterium exchange electrospray mass spectrometry; characterization of oligonucleotides by electrospray mass spectrometry; methods and applications of sizing DNA by matrix-assisted laser desorption/ionization mass spectrometry; network-based bioinformatics in protein mass spectrometry. "International praise for the first edition. 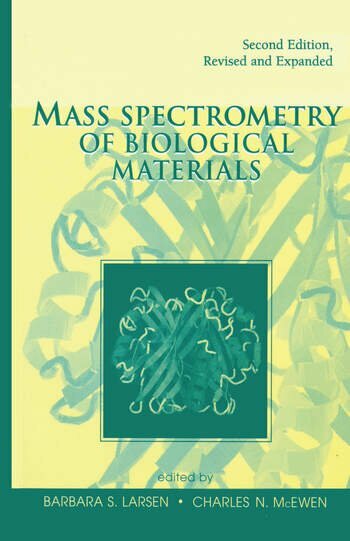 . . . . .highly recommended, both as an essential text for newcomers to the field and as a valuable, integrated and up-to-date reference source for anybody interested in state-of-the-art research in mass spectrometry in biology, biochemistry and medicine. " ". . .a gold mine of information. " ". . .an extremely useful addition to the laboratories (in addition to libraries) of those who are actually engaged in the use of mass spectrometry in the analysis of biological compounds. " ". . .warmly recommended. . .a stimulating reference text. . .It deserves to be on both laboratory and personal bookshelves! " ". . .an invaluable practical manual. "